UK adspend grew at its highest rate since 2010 last year by 7.5 per cent to £20.1 billion, according to the Advertising Association/Warc Expenditure Report. As a share of GDP, UK adspend rose to 1.08 per cent in 2015, the data found. The ad market is expected to grow again this year, despite jitters about a possible British exit from the European Union, with AA/Warc forecasting 5.5 per cent growth for 2016 and for 2017. 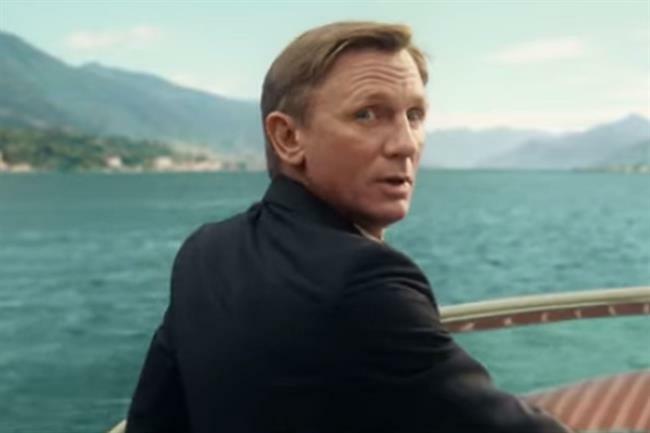 Cinema adspend saw the greatest rise of 20.8 per cent to reach a record £283 million in 2015. The report put this down to the release of Star Wars: The Force Awakens and Spectre. It is expected to grow a further 4 per cent in 2016. The next highest was internet adspend which rose 17.3 per cent to £8.6 billion. Mobile made up 78 per cent of the growth as it increased 61.1 per cent to £2.6 billion. According to the report, the sector will continue to see rapid growth this year. It expects total internet adspend to rise 11 per cent and mobile by 36.8 per cent. TV adspend rose by 7.3 per cent to reach a record £5.3 billion. This was made up of a growth in spot spend of 6.7 per cent to £4.8 billion, and a 20.7 per cent increase in video-on-demand to £175 million. The report said total TV spend is forecast to rise a further 5.1 per cent in 2016. Radio adspend, including branded content, grew 2.9 per cent to £592 million, and out of home spend rose 3.9 per cent to a record high of £1.1 billion. However it wasn’t good news for print. 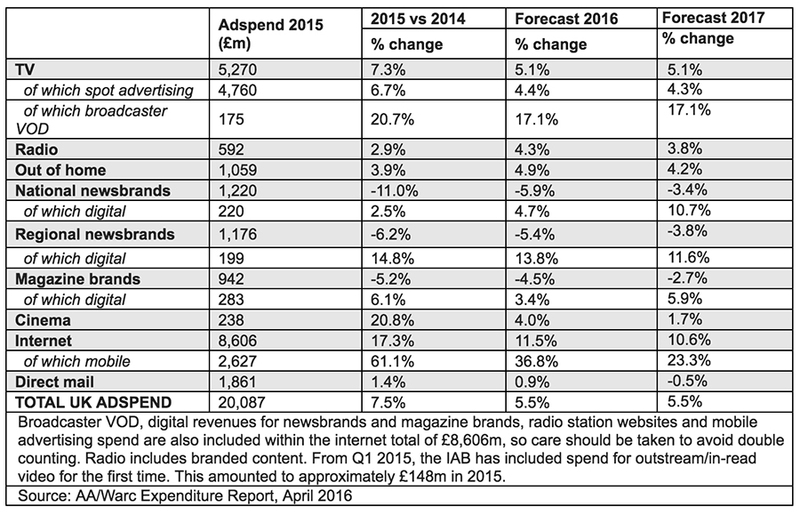 Adspend for national newsbrands dropped 11 per cent to £1.2 billion. This was made up of print ad revenues falling by 13.4 per cent to £1 billion; however digital adspend increased by 2.5 per cent to £220 million. The report added: "Looking at print advertising revenues more closely, there was a 16.7 per cent drop for popular (tabloid) papers, and a more modest 9.2 per cent drop for quality (broadsheet) titles." It expects a slower decline this year of 5.9 per cent. For regional brands the adspend dropped 6.2 per cent to £1.2 billion. Again, there was a drop in print adspend of 9.5 per cent to £977 million, and a rise in digital by 14.8 per cent to £199 million. For magazines, adspend dropped 5.3 per cent to £942 million. Print fell 9.3 per cent to £659 million, and digital increased 6.1 per cent to £283 million. Data from the Royal Mail showed that direct mail spend grew 1.4 per cent to £1.9 billion. Tim Lefroy, the chief executive at the Advertising Association, said that the UK is the "fastest-growing major advertising market in Europe, and its most successful exporter". Victoria Fox, the chief executive at customer relation management agency Lida, said: "Overall, the results reinforce optimism for UK adspend. "However, what stands out for me is the need to focus on how we effectively engage customers. This is evident in the direct and digital space and with internet advertising. "It’s in this space that the creative world needs to move in step with the media opportunities to make sure every piece of communication is eliciting the desired response."